With Star Wars: Episode VIII’s release date pushed back to December 15th, 2017, unFOMO wanted to tease you with the top 6 most likely predictions. While the majority of Star Wars fans all loved TFA, it did raise just as many questions as it gave answers. This, of course, is nothing new to the franchise. Back in 1980 audiences’s had to wait three years to find out if Han Solo was still frozen in carbonite. 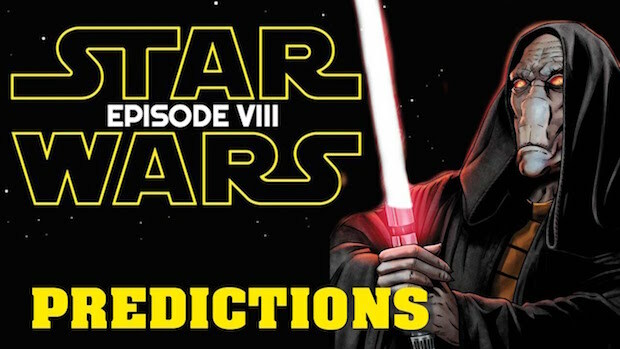 Here are the top 6 most likely predictions for Episode VIII. What am I going off of? I have a secret spy in Disney giving me all the insider secrets… Well no, not actually (our lawyers made us say this). But as a superfan, I’m almost always right. Oh and it goes without saying but, SPOILER ALERT, for the three people who haven’t seen TFA yet. 6. Is Rey Luke’s daughter? We begin with Rey being trained by Luke. He’s getting her ready to fight with Kylo Ren and Snoke. We repeatedly see similarities both between her and Luke as well as a mirror of Luke’s training with Yoda. Then 2/3rds the way into the movie, in the heat of adventure, Luke reveals, “Rey, I am your father.” Echoing Darth Vader’s line from Empire. Well of course by now you’re asking, ‘who is Rey’s mother?’ Easy enough, she was one of Luke’s students that was training to become a Jedi, before Kylo Ren killed her. This is how Luke got a wife in the now defunct ‘Expanded Universe.’ Luke’s wife, Mara Jade, a force sensitive agent of the Empire. When Luke started the new Jedi order, Mara was one of the first he recruited. This is all good and well, unless you consider . . . I already mentioned that the non-canon Expanded Universe, Luke’s wife Mara Jade is a Jedi. Well, in those same works, Han and Leia have a set of twins. The boy, Jacen Solo, turns to the darkside and kills Mara Jade. This could be the inspiration for Kylo Ren and the Knights of Ren destroying the new Jedi Order. As well as potentially killing Luke’s wife in the new canon. It could also mean that Jacen’s sister, Jaino Solo, is paralleled by Rey in TFA. This leads to theory #2: Rey is Kylo’s twin sister. Her chemistry with Han was strong from the start and Leia looked at her as though she recognized her. Though that could be chalked up to force sensitivity. But there’s even times in the books where Jaina is flying in the Millennium Falcon with Chewbacca, JUST like we saw in the movie. So the brother-sister thing is very possible, though not much of a twist since it happens in the books. 4. What if Rey is both a Skywalker and a Kenobi? Say what?! Did I just #breaktheinternet? How can this be? If this would be true, then Rey is a force sensitive Mandalorian of the Skywalker line! Now THAT just broke the internet. 3. Enough about Rey, let’s talk about Kylo Ren! What will we see of him? My guess is that Snoke isn’t going to change his mind about completing Kylo’s training. I also think we’ll see the other Knights of Ren, including other Jedi defectors. When the conflict started, Luke saw the order dying so he had everyone go into hiding for their safety. There’s a good chance we could see a big showdown with the remaining Jedi, including Luke and Rey against Kylo Ren and the Knights of Ren. Put this to a big backdrop of the New Republic fighting The First Order. Picture this…everything I just said happens . . . Jedi versus Knights of Ren, Republic forces versus First Order Stormtroopers. Things start looking bleak for the heroes, then all of a sudden BOOM! Here comes Lando Calrissian flying in with reinforcements, possibly in the Millennium Falcon with Chewbacca as copilot. Since we saw Admiral Ackbar and Nien Nunb return in TFA, why not General Calrissian?! There’s been rumors going around that Supreme Leader Snoke is actually Darth Plagueis, Palpatine’s former master. Well, I think the chances of that are quite likely. Think about it, this big dark, powerful guy who has been around for a long time watching the events of the previous movies play out but not been involved. It’s not too hard to posit the idea that Palpatine THOUGHT he killed him but because he was so powerful he could sustain his life and go into hiding, watching until Anakin, the chosen one created by the force, through his powers, could crush both the Jedi and the Sith. This would leave only him to rule the galaxy. The only one in his way is Luke…a half trained Jedi that couldn’t even defeat Palpatine on his own. Even the score that’s played during Snoke’s scenes is nearly identical to the scene where Palpatine tells the story to Anakin of Darth Plagueis the wise. It all makes too much sense. If all of the above holds true, then in Episode VIII, we could get the biggest full circle reveal since “No, I am your father”. What do you think will happen in Episode VIII? Comment below!